I really hate feeling like I'm about to freeze to death while playing. It's stressful enough without shivering while playing. I even packed a sweatshirt for playing in Vegas IN JUNE! I should really consider getting a shawl of some kind. Also, I apologize for not directing you to the questionable skills big stack from my table last night when I bumped into you at the cashier on my way out of town. It just didn't occur to me at the time. Anyway, it was a pleasure meeting and playing with you, and I'm sure our paths will cross in AC of LV (or even DC) in the future. @Tarpie: Of course I remember you, Tarpie, but I'm afraid I was too obtuse the to catch the junket reference. Mostly, it's that there are a bunch of us who come up to AC that way, and I just assumed you overheard some discussion of it previously. I do also recall playing with you previously; I hope our paths will cross again one of these days. @All readers: Perhaps I ought to come up with some catch phrase like "'Sup bro." or "The brown trout, etc." so that readers can identify themselves without blowing their cover or mine. If you come up with a suggestion for said catchphrase that I end up endorsing, I will award you some kind of prize. It will undoubtedly be lame, but still: a prize! 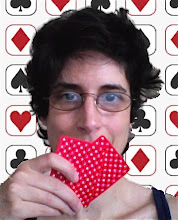 Even if I don't know anything about poker and I'm modestly interested in the game per se, I find your writing very good and entertaining, that's the reason I read your blog, and the fact that I know you too (I doubt I found your blog another way). @Shrike - If Dario Minieri and Joe Speaker can pull off the scarf look, so can you! How about, "Wow! Am I ever epically card dead tonight!" ?? My time at the Bellagio went well, though I did not win a lot. Full trip report coming soon in the PA forums. I suggest: "You look a lot like the picture of a spewtard I once saw on the internet."